Russian President Vladimir Putin led a high-powered delegation to Baku this week, and security issues seemed to be high on the agenda, leading to renewed speculation about whether the traditional geopolitical allegiances in the South Caucasus may or may not be shifting. During our talks we paid a great deal of attention to resolving problems in the Caspian region. We are interested in seeing this region become one in which peace and cooperation reign. There are still many unresolved issues here, relating to security, border delimitation, conserving biological diversity in the Caspian Sea and so on. We have a vested interest in resolving all these problems, naturally taking into account the interests of all littoral states. It is symbolic that our talks coincide with a friendly visit of a detachment of the Russian Caspian Flotilla to Baku. The Dagestan missile ship and the Volgodonsk small artillery ship are among the vessels. At the end of 2013 Azerbaijani sailors plan to make a return visit to Astrakhan. Naturally, during our talks we touched on current international issues, including the Nagorno Karabakh conflict. I would like to emphasise that Russia is actively facilitating the conflict’s accelerated settlement, which is only possible through political means. For his part, Aliyev noted that the "defense industry collaboration" between Azerbaijan and Russia totals $4 billion and continues to grow, though it's not clear what that figure represents and Azerbaijan has been known to exaggerate the scale of its military activity for PR purposes. But what the two men discussed when the cameras were off was the subject of much curiosity in Moscow, Baku and of course Yerevan, as Armenians wondered what all this meant for them. While Armenia is a close ally of Russia, hosting a Russian military base and being a loyal member of the Collective Security Treaty Organization, there has been some concern between the two partners, as Armenia is being wooed by the European Union and Russia has been selling some big-ticket military hardware to Azerbaijan, which would likely use the equipment against Armenia. Naturally, much speculation about the visit centered around Azerbaijan's upcoming presidential elections, since the main opposition candidate, Rustam Ibraghimbekov, lives in Russia and will depend on Russian governmental help to get his paperwork in order to run. Might Russia be dangling Ibraghimbekov's fate in front of Baku for some sort of concession in foreign policy? It certainly seems possible. 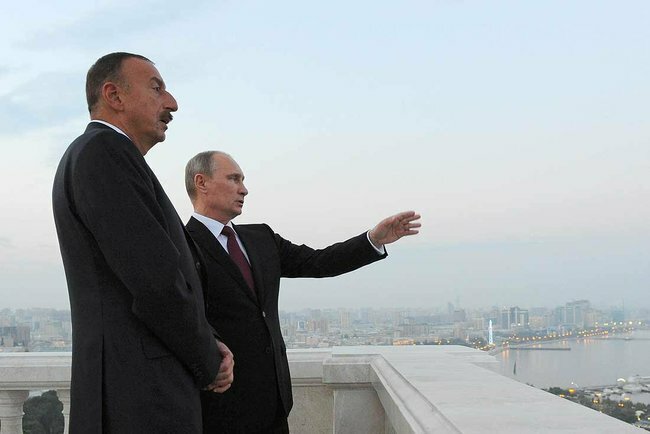 While Russia billed its naval deployment to Baku as a "friendly visit," it's not clear that Aliyev saw it that way. Azerbaijan is developing its navy in large part because it fears Russia's ability to bully it militarily. So Azerbaijan is caught in the same dilemma as many post-Soviet states, where military "cooperation" with Russia serves to bind those countries' foreign policies closer to the Kremlin's. As for the inclusion of the Minister of Defense Sergei Shoigu in the delegation, according to the analyst, "there are questions in the military sphere which should be discussed. "This is not just military-technical cooperation. It's very important to discuss questions which can affect Azerbaijan. For example, the situation in the Caspian, where military activity is increasing, there is the context of Iran, developing events in the Middle East, plus the most important -- settlement of the Nagorno Karabakh conflict," Musabekov told journalists. According to him, Russia cannot but have a certain wariness toward Baku becoming an important logistics center, through which Afghanistan transit is conducted. For that reason, Moscow needs a strong guarantee that American armed forces will not appear here [in Baku] tomorrow. A few other important words did not get uttered in the meetings. So to sum up, it's hard to know what to make of all this. It remains unclear whether we are seeing a tectonic shift underway in the geopolitics of the South Caucasus, or (excuse the mixed metaphor) whether this choppiness on the surface hides a deep, stable sea underneath.